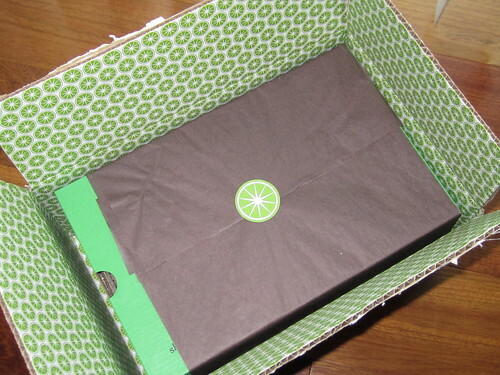 I've been writing this post in my head since I received a shipping confirmation email last week. Well, to be honest, I've been planning this post since April. 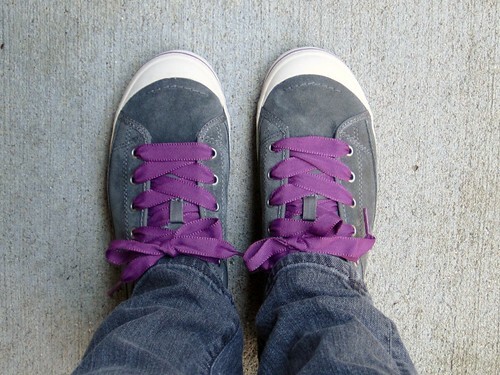 That's when a friend in Chicago sent me an email about some new shoes she'd just gotten, complete with links to view them online. After appreciating her good taste (and feeling a little jealous of her new fancy footwear), of course I had to check out Piperlime's Sale listings to see if any shoes might be looking for a good home in my closet. Ta-da! 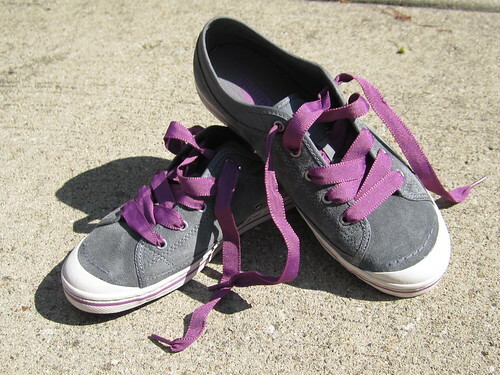 The good news is that I got these grey suede & purple Simple sneaks for a steal. The bad news is that they were backordered until mid-July. Some shoes are worth the wait! 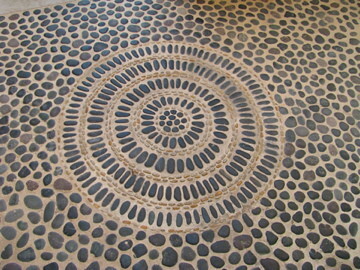 I was pleasantly surprised to arrive at our hotel in Ixtapa, Mexico and find such beautiful mosaic floors made out of local stones. The pacific coast of Mexico is very rocky and jagged and while the lush plants are colorful and vibrant, the tones of the sand, rock and landscape is much more like the rocky coast of California and Oregon. We loved it! I thought that their creative use of the local stone and the amazing design really added to a feeling of calm and serenity. 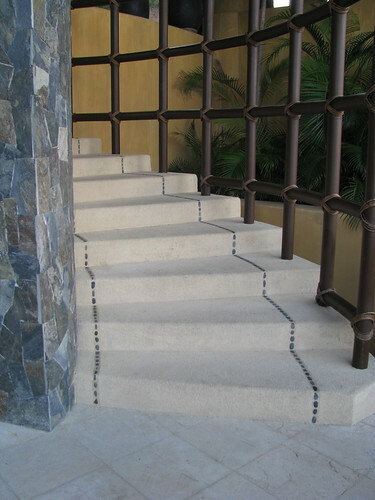 I think in particular the detail on this stairway could easily be replicated near a patio or backyard pool. 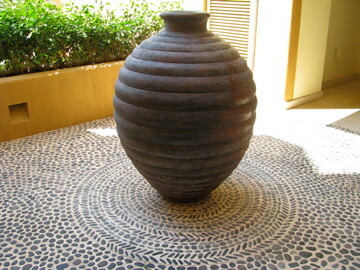 In addition to the floors, the clean lines of this beehive vase set in the hotel's lobby was a favorite of mine. Hard to replicate at home, but a beautiful design idea none the less. I'm ready for a trip back! A visit to Biltmore Estate in Asheville, North Carolina, isn't complete without a stop at the Creamery in Antler Hill Village. The ice cream is made with milk supplied by the estate's own dairy cows. 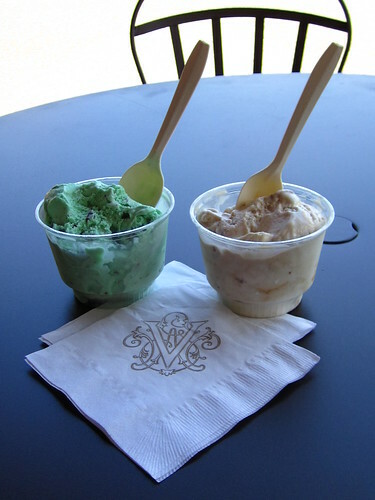 On a hot day in the Smokies, this cool treat was just what we needed to wrap up a lovely first visit to Biltmore. That's mint chip on the left and pecan praline on the right. Yum! 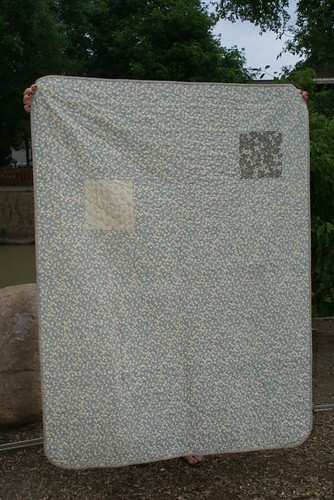 Since I finished my houndstooth quilt (see this post), the long 4th of July weekend was the perfect opportunity to dig into my next quilt project. 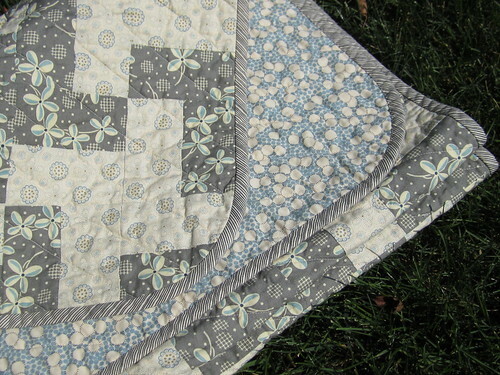 The fabric is a Botany jelly roll (precut 2.5-inch strips) that my sister bought me at a little quilt shop in Breckenridge, CO. The pattern is Random Reflections from Freckled Whimsy. The strips are in groups of 4 now, but they'll come together in groups of 5 and the layout will change to create a jagged reflection. So far, I'm enjoying working with some bright, summery fabrics. 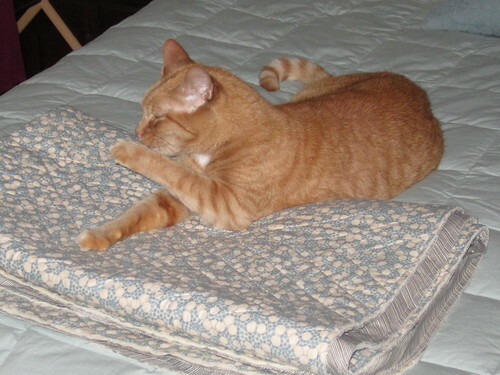 In a final push to finish my houndstooth quilt, I sewed the binding to the front and then saw this happening -- my cat Jack attempting to claim this quilt for himself. So I ripped it from his warm, fuzzy feline clutches and finished it up. 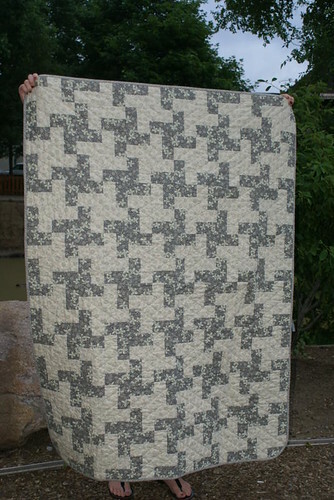 For the pattern, I started with a pale houndstooth baby quilt pattern from a book, Baby Love, that I picked up at my local quilt shop. My comfy color palette is blue and green, so I tried to go a different direction with grey (Denyse Schmidt Hope Valley) and cream (Simple Abundance).